The firm comprises of the law firms of David Garrick & Co. and Olugboyega Kayode. Also we have been in active Legal Practice for over thirty years and has three main divisions namely Intelectual Property Law, Corporate Law and General Practice. Filing and Prosecution of applications for the registration and grant of Industrial Property rights and the maintenance of the same. 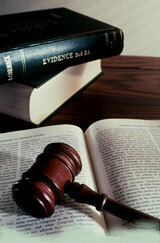 The Firm also deals with litigation arising from these ights. We are equipped to monitor renewals and annuities. The firm has in its establishment well trained personnel handling the prosecution and the maintenance of Industrial Property applications. The Corporate section of the Firm deals with incorporation of companies and obtains business permits and expatriate quota for foreign Investors in all aspects of business operations in the country. The Firm handles corporate and personal taxation.